Cleverly conceived ideas, unique solutions, numerous patents - the EuroCompact is the transport system for meeting all challenges of tomorrow! 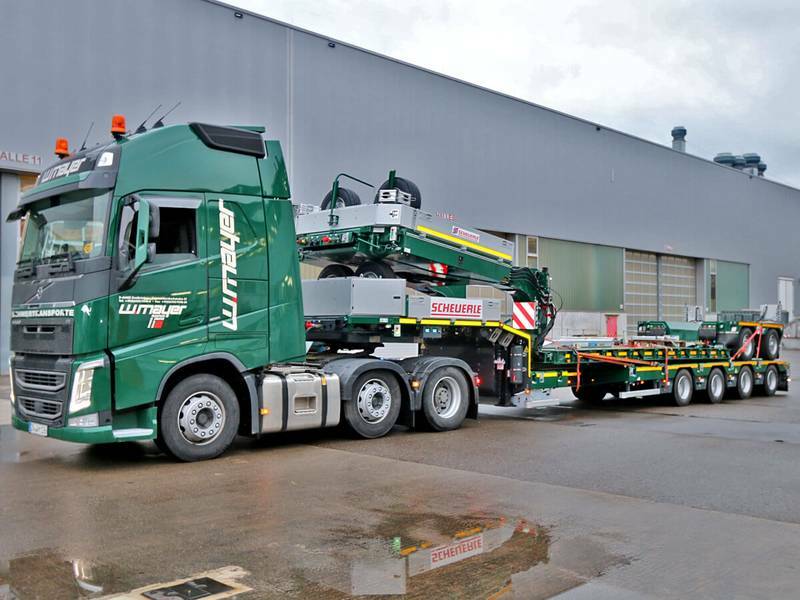 Our customer W.Mayer from Zweibrücken also now relies on the outstanding capabilities of this vehicle and has expanded its fleet through the purchase of a EuroCompact 0+2 combination with telescopic frame deck and a EuroAxle 4-axle low bed semi-trailer complete with a telescopic section. This type is the latest addition to the EuroCompact series. The short and narrow 2-axle vehicle offers uncomplicated, approval-free transportation of construction machinery up to 30 tonnes as the total length of the combination is 16.5 m.
The unrivaled dead weight/payload ratio along with the most compact design in this segment provides important competitive and cost advantages. Low wear, an extremely flat deck and excellent manoeuvrability due to the optimized steering system and large steering angle rounds off the product and makes it an indispensable element of the construction industry. The EuroAxle vehicle makes an impressive case through its independent suspension. The maximally-reduced design without a transverse control arm minimizes all causes of wear and is therefore maintenance-free. The vehicle is available with 3, 4, 5 or 6 axles and is equipped to handle all load cases thanks to the telescopic centre beam and the lateral vehicle widening.